8 oz peel & serve tray. All natural. America's No. 1. Dip it. Top it. Spread it. Love it. Made with hand-scooped hass avocados. 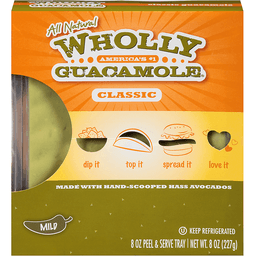 Your Every Day Treat: Whether you're rockin' taco night or getting your grill on, add all natural, no preservative Wholly Guacamole dip to your meal and give your friends and family a treat you all deserve! (hashtag)WhollyTreat. Twitter (at)eatWholly. Instagram. Facebook: Wholly Guacamole. Pinterest. We welcome your comments: eatwholly.com/contact-us. Gluten free. Please recycle. Sustainable Forestry Initiative: Certified sourcing. www.sfiprogram.org. No preservatives. Kosher certified. Product of Mexico. Peel & serve tray. Made with hand-scooped hass avocados. All natural. America's No. 1. Dip it. Top it. Spread it. Love it. Your every day treat. 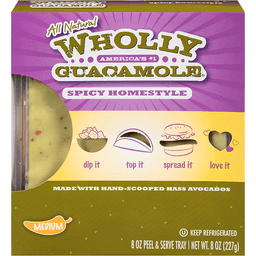 Whether you're rockin' Taco Night or getting your grill on, add all natural, no preservative Wholly Guacamole dip to your meal and give your friends and family a treat you all deserve! Hashtag WhollyTreat. Twitter: at eatWholly. Instagram. Facebook: Wholly Guacamole. Pinterest. We welcome your comments: eatwholly.com/contact-us. Gluten free. Please recycle. Sustainable Forestry Initiative: Certified sourcing. www.sfiprogram.org. No preservatives. Gluten free. Kosher certified. Product of Mexico. 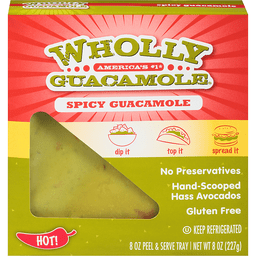 Wholly Guacamole® Spicy Homestyle Medium. All natural. America's #1. Made with hand-scooped hass avocados. Dip it. Top it. Spread it. Love it. 8 oz Peel & serve tray. Net Wt. 8 oz (227g). Your everyday treat. Whether you're rockin' Taco Night or getting your grill on, add all natural, no preservative Wholly Guacamole® dip to your meal and give your friends and family a treat you all deserve! No preservatives. Gluten free. Please recycle. We welcome your comments: eatwholly.com/contact-us.